The entries of this menu invoke the web browser in order to perform a web search on the current text selection. For example, if you select text "Pi" in the document view and select menu item Wikipedia, this will open a window or tab in your web browser showing the definition of Pi in Wikipedia. The entries of this menu are not fixed. They may be configured using Options → Preferences, Web Search section. Note that the entries of this menu have no keyboard shortcuts. Instead, you need to press the underlined character found in the title of the menu item (the “hotkey”). 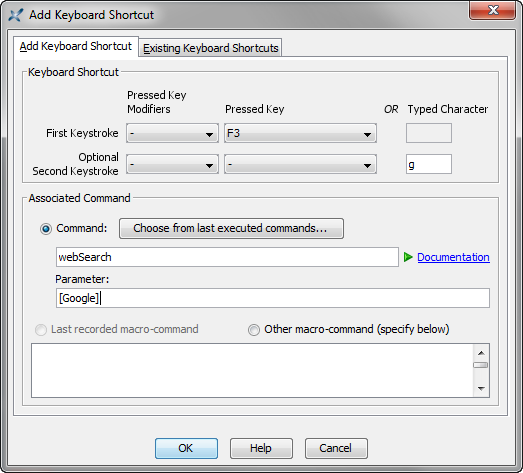 For example, If you want to perform a web search using Google, you must press Alt+S (for menu Search) then W (for submenu Web Search) then G.
If you prefer to use a real keyboard shortcut, then you'll have to define it using Options → Customize Configuration → Add Keyboard Shortcut. When you'll do this, note that the name of the command to be invoked is webSearch and that its parameter is the name of the web search service put between square brackets. Example: [Google]. Not available on the Mac.